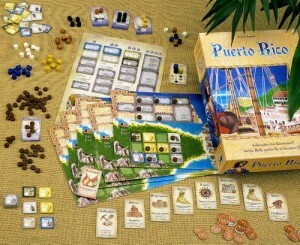 Puerto Rico – one of the best rated games on BoardGameGeek, multiple award-winner and a classic. I bought Puerto Rico many years ago (probably around 8 years ago) and it never made it to the table despite me really wanting to play such a revered game. The problem was that it was a bit too long for my lighter gaming group and didn’t seat enough players for my experienced gaming group which usually has 6 players. So, it sat on the shelf until earlier this year.